Home Blog The coming storm in Iran? In Iran today, men and women, young and old, rich and poor, are courageously taking to the streets in ever-greater numbers and frequency to protest a clerical regime that continues to deny them the basic human rights that are guaranteed to them. Those protests have spread across the country. Last week, the minister of interior admitted that protests were taking place in more than 100 cities. Protests against the regime in Tehran are not new, but the latest protests — which first erupted last December — seem different. Why? Because they involve all sectors of Iranian society, especially the farmers and the poor, those elements of society that the regime has always counted on as its bedrock of support. In American political jargon, the “base” is in revolt, protesting the rising cost of food, the lack of clean drinking water and little economic opportunity, as well as a lack of freedom and human dignity. The protests will continue because the regime is both unwilling and unable to address these legitimate grievances; it would mean putting an end to its corruption and economic mismanagement. Tehran has squandered billions of dollars on foreign adventures that could be used to help the Iranian people, sending its young men off to fight and die overseas for causes that the Iranian people do not support. And the protests will continue because the youth of Iran are leading them. Media reports tell us that 85 percent of all those protesters arrested by the regime are under the age of 35. The young people are not going to go away; they are the future of Iran. These events are connected to us in the United States not only because we wish the Iranian people to one day enjoy the benefits of democracy that we enjoy every day. They’re also connected to us because it’s our responsibility as Americans to help the Iranian people who want a better future for their country. What can we do? Well, we have a president in the White House who is willing to try many policies that his predecessors had been unwilling to pursue. I doubt that he will be intimidated by the ayatollahs. As a matter of policy, we need to continue to draw the world’s attention to the regime’s brutality and its illegal crackdown on its citizens. We need to add senior Iranian officials to the list of international human rights violators so we can impose sanctions on them. We need to help create secure internet and social media channels so the Iranian people can communicate with one another without the regime’s interference. We also need to counter the spread of the Iranian regime’s influence in the region, working closely with our friends and allies to defeat and deter Iranian forces and their proxies in Iraq, Syria, Lebanon, and Yemen. And we need to send a strong signal to the Iranian people that we support their democratic aspirations and, like them, want a representative government in Iran that respects the rule of law and honors its own people. There is bipartisan support in Congress for this effort. 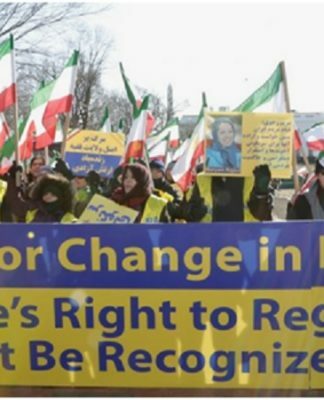 There is a leader in exile, Mrs. Maryam Rajavi, the president-elect of the National Council of Resistance of Iran, who has developed and endorsed a declaration of human rights, a 10-point plan that mirrors our own Bill of Rights. And most importantly, there are the hundreds of thousands of Iranian people who are bravely demanding a better life. Iran’s brutal behavior inside the country and aggressive actions across the region erode our security and demean our values. The good news is that forces of progress toward a secular, democratic, non-nuclear republic Iran are more organized, more mobilized, and more energized than they were a year ago. The world is watching. And it is siding with the Iranian people. Mitchell B. Reiss was the director of policy planning at the State Department from 2003-2005. He may be contacted at mitchellreiss@yahoo.com. Next articleIran’s Nobel Laureate Is Done With Reform. She Wants Regime Change.